Home / Uncategorized / How to NOT fall on the Ice! How to NOT fall on the Ice! The snow has been falling for weeks and ice is everywhere. It is hard to walk from your car to the door without finding yourself on a patch of slick ice. My parents recently retired and moved from the warm and humid climate in the south to our frozen city where ice sets up a permanent residence nine months of the year. Suddenly I find myself not only teaching my 9 month old to walk, but my 60 year old parents as well! Walking on ice can be scary, but it can definitely cause more complications once you hit a certain age of “maturity”. Here are a few tips to give you some confidence on the ice this winter. First of all, slow down! Make a more conscious effort to walk carefully and safely. Just being aware of the need to be careful and not distracted by a phone or other things can make a huge difference. Know your surroundings! Be aware of the path ahead of you. The obvious path is not always the safest. For example, a sidewalk that was cleared the day before but had a thin layer of melting snow freeze over it the following morning may not be the smartest path. Walking on the snow covered ground right next to the sidewalk can often give you much more traction and safer travels. Avoid stairs and slopes when possible. Stairs are so hard to scrap or shovel and just plain dangerous covered in ice! Go around them if there is another route. If they are unavoidable make sure you use any handrails to keep your balance. Remember that even though the sun may be out and melting the ice on the roads, it can still be very slippery, in fact a ground frozen solid with ice is safer to walk on than melting ice that tends to offer much less friction to your step. Be careful around black ice. Black ice is simply a term to mean ice that has frozen over a dark surface like the road that makes it hard to see. Hidden icy spots can be the most dangerous because they take you by surprise. If the temperature is right and the road looks wet- always be cautious of black ice. What does walk like a penguin mean?! We hear this all the time but what exactly does it mean? Is there any truth to it or is just a hoax to make us all look funny in the winter? Scientists have proven that humans do indeed have a lot to learn from these animals that spend a lot of time walking carelessly on ice. Here’s the difference: humans keep their center of gravity in between both legs meaning that either leg is always holding half of your weight at any given time at a slight angle. However, penguins center all their weight over one leg at a time keeping all the weight vertical. The weight applied vertically is a lot safer than always walking with a slight angle on ice. Test the surface with the leg without your weight on it first before transferring your weight to that leg. Penguins also have short legs so they have to take short steps that look more like a waddle or shuffle. We can also benefit from shorter steps. This will naturally slow your stride and make you more cautious. Leaning slightly forward while you walk can also keep your center of gravity over your feet. Keep your knees slightly bent and your hands out of your pockets for balance. However, if you do fall try not to catch all your weight with your hands or it will injure your wrists. Try to fall towards your hip and forward if you have any control instead of backwards. Wear the right shoes. Find a boot with a solid rubber grip. The better the grip the more friction and slip resistance you will have on ice. It is surprising how many shoes and even winter boots have slick leather bottoms that make staying vertical extremely challenging on ice. If you feel like the rubber sole along will not be enough, there are more serious traction boots with cleats or spikes on the bottom. Additionally, they now sell cleat spikes that you can put on any regular pair of shoes or boots for extra traction in the snow and ice. Take precautions. It may not always be possible to prepare the area where you will be walking but where it is possible, definitely take precautions. Shoveling is probably the most obvious one but is an easy one to ignore- especially if the weather is supposed to warm up and melt the snow anyways. Why waste all that work if the sun will do it for you? The snow may melt with the sun but doesn’t always completely dry. This leaves a layer to freeze in a perfect sheet of dangerous ice. A favorite of ours is to sprinkle a layer of Ice Melt on our porch, stairs, walkways and around our uncovered vehicles. Not only will this help the ice melt but it adds from traction to your step. 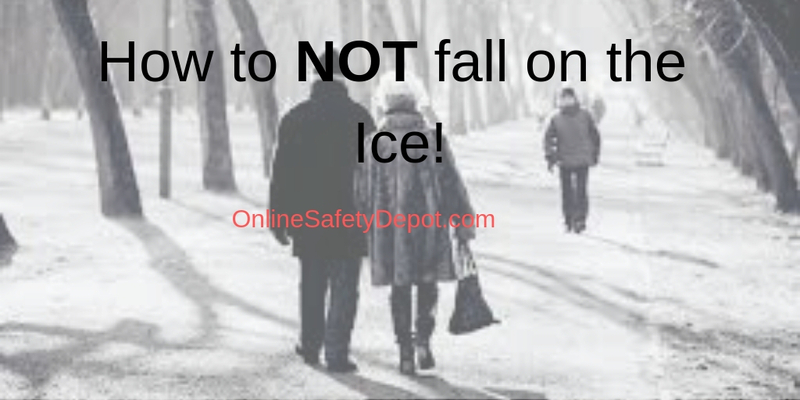 Take your time this winter and walk with caution to stay vertical and safe on the ice.